There will be much discussion this week about how the Portland Timbers will handle Atlanta United's dynamic attack in the MLS Cup championship game, 5 p.m. PT Saturday at Atlanta. There will be chatter about Darlington Nagbe playing for a championship against the team he was such an integral part of for seven seasons. There will be buzz about Portland keeping cool in front of 70,000 mostly rabid ATL fans. One thing that might fly under the radar a bit is the ingredient that applies across all team sports. Culture is a buzzword these days in business and in team sports. It is overused. But in the case of the 2018 Portland Timbers, it is underappreciated. Let's face it, very few people outside the Timbers Training Facility in Beaverton — this reporter included — pictured this team playing December soccer. The doubt was not so much about the Timbers — though their 4-8-5 regular-season road record gave reason to pause. Seattle was the hottest team entering the playoffs. Sporting Kansas City was the most consistent team in the West. Yet, here they are, one more unexpected win away from adding a second MLS Cup title to the trophy case. Arriving at the brink of a championship took some brave play from goalkeeper Jeff Attinella, who made several huge stops in the first half to keep Portland in last Thursday's match at SKC. It took what must have been a colorful halftime speech from coach Giovanni Savarese. And it took a goal for the ages from one special player and two more special plays to get Portland across the finish line with a 3-2 victory in the West finals at Sporting KC. None of that should come as a surprise, particularly the magic of Diego Valeri and Sebastian Blanco. Valeri was not the 2017 MLS Most Valuable Player by accident. He is one of the best players in league history, and anyone who listened to him over the second half of this season could not question his commitment. Seldom was there an interview when the maestro didn't say first and foremost that this season was all about earning a second star above the Timbers logo on his jersey. At 32, he understands that time will catch up with him sooner rather than later. "You never know if this will happen, but you fight for it," Valeri says of reaching the MLS Cup final. "When we started the preseason, we knew that step by step in a long season that is MLS, you can make it. We had moments where we had to improve and become better in some aspects … but we were very confident." Valeri did experience one moment of disbelief in Kansas City last Thursday, grabbing his head in surprise when Blanco's 30-yard strike dipped under the crossbar for the game-changing goal. "I didn't expect him to kick from (there) — it was a long distance. It was far. I was making a movement, JeBo (Jeremy Ebobisse) too, and he decided to kick. It was just unbelievable how the ball came down so quick," Valeri says. "A beautiful goal and very important." 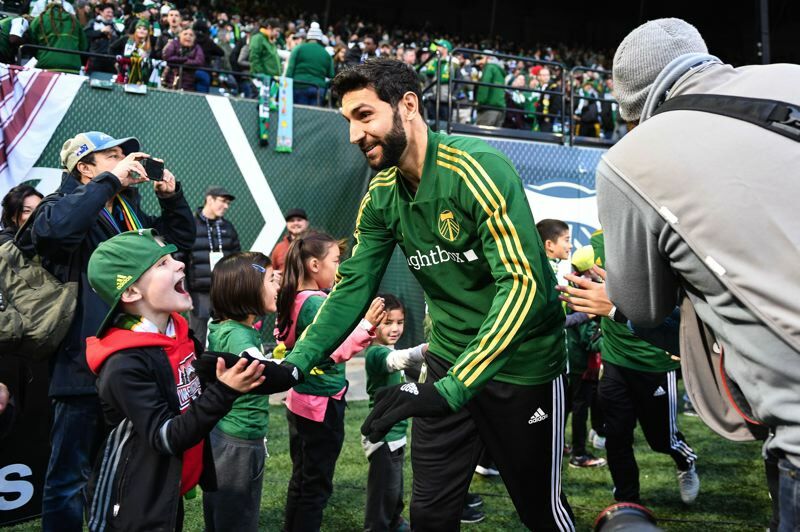 With Valeri, Blanco and Diego Chara, the Timbers had the spine to be a contender. But from the outside, it made sense to wonder what Savarese — in his first season as an MLS head coach — could get out of a roster that sometimes felt as if it was caught between the present and the future. Inside the club, there was a certain calm, it seems. Even when the team was winless through five road games, belief in the process remained. The 15-game unbeaten run that followed helped. "I think that's when it started to click that things are a little different," defender Zarek Valentin says. "Instead of crumbling, instead of getting down on ourselves and pointing fingers, we dusted ourselves off, looked in the mirror and got back to it." That unbeaten stretch solidified players' trust in the new coaching staff and provided the blueprint that has carried Portland through the playoffs. The approach emphasizes frustrating opposing attackers, first and foremost. Everyone not named Valeri or Blanco (who also does his share of defensive work) buys into defending first: limit opponents' scoring and wait for Valeri or Blanco to produce a goal. "These guys all have fantastic relationships, and it's fantastic to watch as a defender," Valentin says. "And that's why you see me celebrating so hard (on goals), because we work our butts off back there to try to keep a clean sheet." Valentin says Savarese and his staff "changed the culture around here. It's very clear to see that, just the cohesiveness we have in our group. That starts from the top down." The coaching staff, Valentine says, "wins and loses with us. That's something new to this club and something that's given us a lot of life. It's a joy to play for a staff like that. It makes you want to win more for them." A year ago, the Timbers were a team in limbo. Caleb Porter — whose tenure was a smashing success — stepped aside in mid-November, a decision that surprised. Before 2017 was over, Nagbe had been shipped to Atlanta, a sign that a course change was underway. It wasn't all clear sailing. Those first five games, capped by a collapse at Orlando, raised questions. Liam Ridgewell, the once-team captain, played in only 13 of the 34 regular-season games and recently reflected that he wasn't sure he would finish for Portland in 2018 — let alone be pursuing another championship. Along the way, Portland parted ways with Fanendo Adi and brought back Jorge Villafana and Lucas Melano. The addition of left back Villafana was a significant addition. Early in the season, rookie Cristhian Paredes was a regular starter in midfield. But once David Guzman returned from the World Cup and focused on the Timbers, he became an important contributor. Guzman's role in the playoff push might be less recognized than that of his teammates. Injuries and international duty with Costa Rica caused Guzman to miss 16 games early in the season, and it seemed to take him time to understand or to buy into what Savarese expected from him. The Timbers got past Seattle without him except for the first half of leg one, but Guzman's willingness to disrupt and ability to distribute with either foot provided extra security in front of the back four. "He's a competitor," Savarese says. "He can get good moments in the attack when we need him, but also he can defend in a good way. Being disciplined in the middle is important. But the biggest quality he has is that on the ball he's very good. He can make good decisions on the ball." Guzman is comfortable playing the ball with either foot, which helps him switch the direction of play. That's an asset. "It's a lot of little things that make jobs easier for everyone around the field. That's for me what clicks most having him in there," Valentin says. Perhaps we should not be surprised that things are clicking for the Timbers when it matters most. For Savarese, this is the fifth time in six seasons he has guided a team to a championship match. He led the New York Cosmos to five North American Soccer League title games and won three of them. He insists there is no magic formula. "I's always important to have a good culture, to have a great mentality, to make sure that each one plays selflessly for the team," Savarese says. "And, yes, you have individual players that can bring magic into games — Valeri, Seba — but the unity of the group for me, good locker room, making sure the guys enjoy coming to practice, enjoy difficult moments, that's a good thing."